Beautiful Updated Victorian, with stainless steel Appliances and Granite countertops, in the heart of Beach Haven Historical District, across from Bi-Centennial Park, *Third property from the Beach, Steps away from the Museum, Showplace, Surflight Theater, Wonderful Restaurants, (on the same block) sit in the porch of this beautiful home and see the world go by( rain or shine). Large yard, property is fenced in, ideal for children to play, also the Bicentennial Park across the street provides for bigger and larger playing groups. Walk the streets all around this home and feel that you are in a special area with beautiful turn of the century Victorians and beautiful Shore Cottages. Large Clean Apartment, Steps to the Beach with all the amenities, including WiFi and a Beautiful covered porch facing the Bicentennial Park. The large Bedrooms are upstairs, one being a KING size bed with a sitting area and the other is a two QUEEN, with a sitting room, the full bath is off the bedrooms with a Jet Tub, and individual shower. The large Kitchen, with granite countertops is on the first floor also the half bath and laundry room, and the large comfortable livingroom with a foyer leading into the covered porch. large sofa and a love seat, large TV, Fire place and staircase. Covered Porch, with wicker furniture. And patio on the yard with pic nic table, gas grill for Barbecue. Covered Front Porch with Wicker Furniture, Full Laundry room inside apartment, (Washer and Dryer) Renovated Kitchen with Granite counter tops and Dish Washer, 1 and 1/2 Baths- Full bath with a Jacuzzi tub, King size bed and Queen size beds available for comfort, Ceiling Fans in every room + window air-condition in all Bedrooms, Outside the Apartment -Nice big yard with several barbecues and picnic table sets,and also an outside shower with Hot/cold water, for everyone's enjoyment.. WiFi also available. This is our second time staying here but stayed in apt 1 this time. Great space! Love th location! Glad you and your Family enjoyed apartment 1. The comfort of large rooms, with all the amenities. Can't forget the covered porch facing the park. Had a great rom location was great close to beach as well as restaurants, shops and parks! Thank you! Yes we are in a very desirable location, close to great restaurants and amenities, and steps to the beach. Very clean. Great space in all the rooms. Enjoyed the front porch as well as the gas grills. Just back from my third year renting this fabulous apt. The location,apt. and beach access cannot be beat. Fenced in property great for my young grandchildren to play when not @ the beach. Rental is great for all ages. Wish I could stay longer because the week goes by so quickly.It is always a great time @ the shore esp. when the accomodations are as pleasant as these. Have already booked for next year. Thank you, as you stated the location of my home is great, it is steps away from the Beach, accross from Bicentennial Park, and within walking distance to great Restaurants, Ice Cream parlors, Theater, Museum, etc. 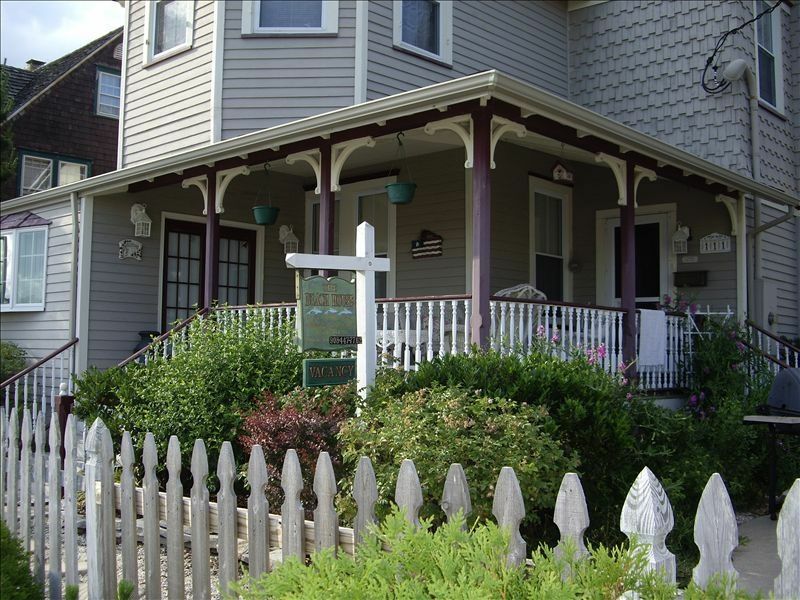 Our family is very proud to own a part of Beach Haven history, our beautiful Victorian home is registered as one of the few Victorians that are still around in Beach Haven and in LBI. Eventhough it was built in 1876 we have kept up with the times, by having all current conviniences of home. It is also, a great location for evening walks within the surrounding streets, which have some of other pretty Victorians, that are protected by the Historical society. We will gladly await for you and your Family next summer. Beautiful Updated Victorian in the heart of Beach Haven Historical District across from the Bi-Centennial Park, third property from Beach. Steps away from the Museum, Showplace, Surflight Theater, Wonderful Restaurants, sit in the porch of this beautiful home and see the world go by.